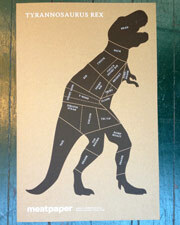 Meatpaper » Blog Archive » Our infamous T-rex poster is now available for purchase! Our infamous T-rex poster is now available for purchase! Based on original artwork by Rebecca Macri for Meatpaper, with help from butcher Ryan Farr of 4505 Meats, this limited edition poster is hand-silkscreened on stiff paperboard. T-Rex might have tasted like chicken (see Issue 9 to learn why) but we like to think of T-rex as having its own T-bone.